The Power of Forgiveness – CounselCare Connection. P.C. It’s challenging to think about forgiving people who have hurt us, isn’t it? We don’t want to let go of the painful memories of abuse, put-downs, broken promises, harsh words, family or work offenses. Corrie resisted. Then, in obedience to God, as she extended her hand towards him she felt the surge of the Holy Spirit pour through her in a supernatural act of forgiveness. Chuck Colson tells the story about a Mrs. Washington who, during a graduation ceremony for inmates completing a Prison Fellowship program, swept to the stage to wrap her arms around a graduating inmate, declaring “this young man is my adopted son.” Everyone had tears in their eyes for they knew that this young man was behind bars for the murder of Mrs. Washington’s daughter. What it means to forgive: Forgiveness cancels a debt someone owes us and restores relationship. It is the only solution in a world ridden with sin and evil to help us start over with people and with God. We learn about real forgiveness at the foot of the cross where Jesus Christ shed His blood to pay for the sins of the whole world. That is God’s kind of forgiveness- – free, sacrificial, no cost on our part. When we experience His forgiveness we want to obey Him like Corrie and Mrs. Washington, extending that forgiveness to others. 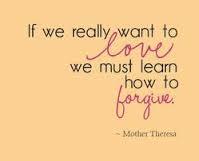 So, how do we practically forgive someone who has hurt us? 6. When it’s still hard to forgive, we can place our trust in God Who will someday judge all the wrongs in the world. We can leave revenge and ustice up to Him….. because Proverbs 20:22 says “Do not say, “I’ll pay you back for this wrong!” Wait for the Lord, and He will deliver you.” and Paul writes in Romans 12:19 Do not take revenge, my friends, but leave room for God’s wrath, for it is written: “It is mine to avenge; I will repay,” says the Lord. 7. When we are stuck in unforgiveness, we can ask to talk and pray with a confidante, a pastor or a counselor to help us deal with the resentment and hurt we feel towards the offender. This will provide a context for release of the painful feelings we are experiencing, provide support, and a better understanding of the person and situation. God’s love and grace is the power behind forgiveness, granting us supernatural power to forgive others, the power to overcome resentment, the power to redeem relationships and show God’s love to a hurting world. © copyright 2002 by Lynette J. Hoy, NCC, LCPC as published in The Godly Business Woman magazine’s Jan/Feb 2002 issue. 2. What’s Good About Anger? anger management books and certificate courses These books and programs teach how to turn your anger into faith, assertiveness, problem-solving, conflict management and forgiveness!